Trevor is in his second year of Cub Scouts. We started the year in a new-to-us Pack and they have blown us away with their awesome activities. This week was their Cubanapolis. We'd never heard of a Cubanapolis before. We were told that each boy creates a vehicle from a cardboard box and wears it during a race... a Cub Scout Indianapolis. The boys have "pit stops" during the race where they have to do various tasks. We were given a cardboard box and told to have Trevor wear safety goggles to the event. After the opening flag ceremony and other business, it was time for the race. The Tigers (first graders) went first, then it was time for Trevor and the rest of the Wolves (second graders) to race. The three pit stops were very clever. At the first pit stop, each boy had his "windshield" cleaned with a spray bottle and paper towel. Ah, so that was the purpose of the safety goggles! I wasn't able to get pictures of the 2nd or 3rd pit stops. At the second one, the boys had their tires checked. They had to get out of their cars, lay on their backs, and have the bottom of their shoes 'inspected.' At the 3rd pit stop, they had to fuel up by drinking a glass of water. Here's Trevor about to cross the finish line. Once all the Wolves had finished their race, they cleared the track for the next age group. Here's Trevor walking away to park his car in the designated parking lot. My favorite part was seeing the amazing creativity of all the boys. There were approximately 50 boys racing and each vehicle was completely unique. Trevor had a blast building and racing his Cubanapolis car. Can't wait until next year! Now that Trevor is back in school, I have a tiny bit of time to do some scrapping. It's only a tiny bit because I just started a new job, bringing my work-from-home total to about 20 hours a week. All three jobs involve writing (as does blogging, obviously, which is not part of that 20 hours). When I'm stuck on an assignment or my eyes need a break from the computer, I head into the scraproom for a few minutes where a huge pile of nearly-complete layouts are waiting. During a break yesterday, I added journaling to finally finish up a layout about the Festival of Trees. Each year, just after Thanksgiving, our local skating center is transformed into a Christmas paradise: the Festival of Trees. Local organizations decorate 100 trees with the theme of their choice, then the trees are auctioned off to raise money for a homeless shelter. Trevor and I have been attending together since he was a baby. He absolutely loves looking at the trees and voting for a winner. 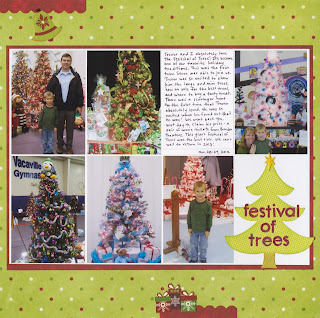 The Festival of Trees lasts just three short days, always Tuesday through Thursday. In the past, Steve had always been working when Trevor and I went, but this last year he was able to join us. Trevor loved showing Steve around and introducing him to what has become one of our absolute favorite parts of the Christmas season. The 2012 Festival was memorable not just because it was Steve's first time there. There was a really fun scavenger hunt, which was something they'd never done before. Trevor absolutely loved it. The best part? Trevor won! It's only August, but I'm already anxious for this year's Festival of Trees! Trevor has been taking a kids' cake decorating class at Every Baking Moment for about six months now. He loves it. Twice a month I sit in the classroom at the bakery watching him create super cute things, dying to jump in there and do some decorating myself. It's a kids' class, otherwise I'd totally sign up. Seriously, it is all I can do not to grab the piping bag from him. Most of the cakes the class makes use the mini ball pan, so when I bought it I told myself it was for Trevor, even though it was really for me. I want to do some decorating instead of just watching him! Check out some of the adorable cakes he's made with this pan. This ladybug was his first cake and might be my favorite to date. He was so incredibly proud of it, and with good reason. Right before Father's Day, the kids made this cake to look like their dad. It was Trevor's first time using modeling chocolate. This is his most recent cake. The ears were made from fondant this time. Each child got a monkey ring to wear after class. I'm thinking our first project with the new pan might be our version of the fish on the packaging. Or maybe something else. Oh, the possibilities! I love it when people display their children's artwork around their house. Lots of people cover the refrigerator with art, while others use their hallway as a gallery. We have an art wall. I think displaying children's art in the public part of the house tells the child that his or her artwork is valuable and worthwhile. I'm frequently inspired by seeing children's art on display. When we visited friends recently, I liked this shark their 2-year old daughter had made so much that I took a picture so that Trevor and I could make our own. Materials: paper plate, black paint, white paint, grey cardstock, white cardstock, googly eyes, scissors, and glue. The first step was to make grey paint. I put Trevor in charge of mixing white and black to make the perfect shade. We actually had grey paint on hand, but he enjoys mixing paints and it is good practice for him to create a specific color from the basics. We painted the back of our plates gray, let that dry, then added a black mouth. We added googly eyes. Finally, we cut out three cardstock fins and a bunch of triangle teeth and glued them in place. I like mine the least of the three. It lacks the charm of the children's versions with their irregular teeth and lopsided mouths. I did have a lot of fun making it though! It's time for August's Project 41, my plan to try each flavor-of-the-month at Baskin-Robbins with a different friend as a year-long celebration of my 41st birthday. August marks six months, the halfway mark. Every month has been awesome and I can't believe I've never done this before. I'm seriously considering eating the flavor-of-the-month with a different friend each month for the rest of my life. 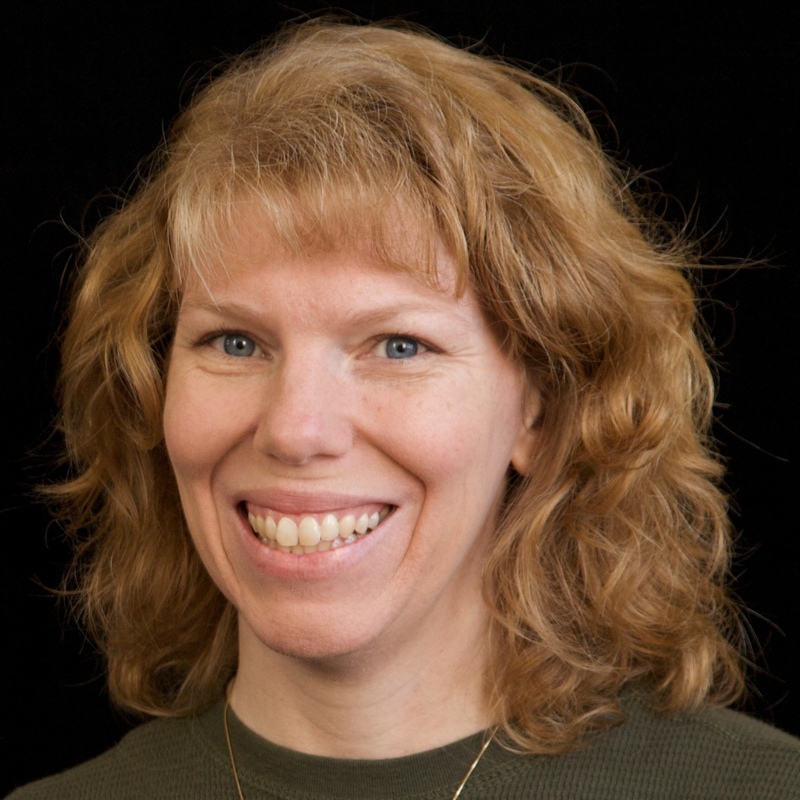 This month, I asked my friend Susan to join me. I met Susan in 2007 when she joined MOMS Club. Since her daughters are older than Trevor, I didn't really get to know her until the following June when I started a term as President and she served as Secretary. We discovered that we have a lot in common, including a love of crafts, reading, and entering projects in the county fair. Even though we "talk" on Facebook, follow each other's blogs, and look for each other's fair entries, we hadn't seen each other in person in about 3 years. On to the ice cream. August's flavor-of-the-month is Oreo Nutty Salted Caramel. According to the description, "Oreo cookie pieces combine with a salty caramel ribbon and honey glazed peanuts all within our delicious vanilla flavored ice cream." Oreo, caramel, honey roasted peanuts and vanilla? Yes, please!! It was SO good. The salty with the sweet with the crunchy with the chocolately... it was heavenly. We both loved it. I'd order this one again and again. Good job, Baskin-Robbins! You've totally redeemed yourself after Triple Vanilla. Susan and I ended up talking long after the ice cream was gone. It was wonderful to catch up with her. Thanks for joining me, Susan! When I begin a Flamingo Four project, I try to focus on the most difficult item(s) first. Rub-ons and flowers could go on anything... layouts, cards, tags, altered items, etc. But an empty box and chess pieces can't, so I decided to start with those. As I played around with them, I realized that the chess pieces fit perfectly in the box. Hmm.. what if I filled the box with all sorts of game-related items? By happy coincidence, I had a deck of miniature playing cards sitting 2 feet away on my desk, so I pulled out the 4 aces and put them in the box. The fit was perfect. I added some poker chips, dice, and Scrabble tiles until the box was stuffed. On to the rub-ons. One of them said "Play," which was perfect for my theme. I transferred it on the box, then added a few white dots to draw attention to the word. Finally, the sequin flowers. After experimenting for awhile, I took apart the flowers and put the sequins in the bottom of the box along with some additional gold sequins. They provided a great bed for all the items to sit in and helped give the box a more finished look. To see what the other three designers made, head over to Flamingo Scraps! This project was my last with Flamingo Scraps. When I applied for their very first Guest Design Team in 2010 (a 4-month term), I never dreamed that I'd be with them for three full years! It's been a lot of fun and I'm so grateful for the opportunities I've had and the wonderful people I've met. I'm ready to move on to new challenges and wish everyone at Flamingo Scraps nothing but the best. Trevor has been working on the Wildlife Conservation belt loop for Cub Scouts. (A belt loop is the Cub Scout version of a Boy Scout's merit badge.) One of the requirements was for him to write a report about an endangered animal and include a picture. He chose to do his report about the giant panda. He did an excellent job writing it and both of us learned a lot about pandas and the loss of habitat that threatens their existence in the wild. Instead of drawing a picture, I asked him if he'd like to make a torn paper panda instead. He was intrigued. We started by gathering our supplies: cheap black and white construction paper, blue and green cardstock, q-tips, a bowl of water, glue and scissors. 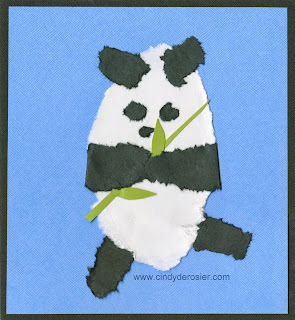 To make the panda, dip the q-tip in water and "draw" the desired shape onto the construction paper. Trace it at least twice, or more times if you're using higher quality paper. In this case, the cheaper and thinner construction paper is better. While it is still wet, gently tear out the shape. The paper falls apart easily along the wet line. Continue using this technique to create all the body parts: a white body and black legs, arms, ears, eyes and nose. Fold a small portion of the arms and legs back. Place glue on just the folded part and glue the limbs behind the panda. Then glue the eyes and nose in place. Glue the body to blue cardstock, then glue the ears in place. 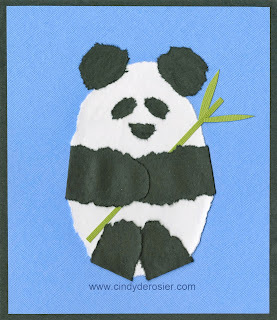 Use scissors to cut bamboo from green cardstock and glue it to the panda. Here is Trevor's finished panda. That's mine at the top of the post. Aren't they cute?! Trevor is presenting his report to his den tonight, the final requirement before he receives the Wildlife Conservation belt loop. I'm pretty sure the rest of the boys will love hearing his report and seeing his awesome panda. Last weekend, we were invited to our friends' house for dinner. Karl had a new grill and would be making kabobs and he asked if I'd bring a "summer side." I thought about a recipe I'd seen in Taste of Home magazine for Summer Corn Salad. I decided to use it as a jumping-off point. Priscilla Yee's version features corn, tomatoes, cucumbers, red onions, basil and feta with a dressing of lime and hot pepper sauce. I don't like spicy food and Steve can't eat raw onions, so I knew I'd be making modifications. I ended up keeping most of the ingredients the same but added some others and changed some of the procedures. Begin by cutting the kernels off three raw ears of corn. Separate 1 cup of corn kernels and set the rest aside. Put butter in a large skillet over medium-high heat. When butter is bubbly, add minced onion and stir constantly for 10 seconds. Add 1 cup of corn and cook for 2-3 minutes, stirring frequently. Remove from heat and let cool completely. In a large bowl, combine cucumber, tomatoes, raw corn kernels, and cooled cooked corn/onion mixture. In a small bowl, whisk together the lime juice, olive oil, salt and pepper. Drizzle over salad and toss completely to coat. Refrigerate until ready to serve. Just before serving, stir in avocado, feta and basil. Yesterday, I showed you how different media perform on Riso film. My next experiment was with spray mist. I sprayed several different colors on the rough side of two chunks of Riso film and let them dry. It worked perfectly! It was beautifully iridescent, ideal to make the jellyfish I've been wanting to make as my J craft. I folded the film in half and traced a large circle, cutting out the two circles at the same time. I used a needle to put a single strand of pink embroidery floss through the center of one circle, then glued the outer edges of the two circles together to make the body of the jellyfish. I set the body aside and cut strips from the second chunk of Riso film. I turned the jellyfish upside down and randomly attached the tentacles using my favorite liquid adhesive, Martha Stewart's Glittering Glue. I taped the string to the roof of my photo tent and took a few pictures. These don't even come close to capturing how gorgeous the color and shine is. A whole classroom of these would look stunning. I hope this inspired some of you teachers out there to do something with those rolls of Riso film instead of just throwing them out! I have a really hard time watching perfectly good things be thrown away. And by "perfectly good," I mean things like empty cardboard tubes, plastic bottle tops, ribbons, glass jars, and other treasures that can be transformed into something awesome. My mom was a preschool teacher, so we grew up making a lot of cool crafts out of items that other people threw out without a thought. Anything we didn't use went into a box at her school labeled "Beautiful Junk." The preschoolers would make all sorts of neat stuff using the items from that box. If you work in a school or in an office with a large volume of copying, you probably recognize it. It is an "empty" roll from a Riso machine. I spend a lot of time at Trevor's school and help with copying fairly often, but I'd never seen anyone change the roll in the Riso until recently. I was shocked at how much material was left on the "empty" roll. It looked half full! I asked the office staff if the roll was indeed used up and they assured me it was. With their blessing, I took the roll home to figure out if the yards and yards of material could be used for something. I cut the film into squares and got out a variety of art materials to test. First up, the most common classroom art supply, Crayola crayons. They colored beautifully. The colors went on smoothly and easily. I suspect that if kids were very aggressive with their coloring, the paper would wrinkle, but that could be easily avoided by taping the film to the desk. Next I tried Sharpies. I'd labeled the Crayola crayon sample with a black Sharpie and it worked well, but I decided to make a Sharpie sample anyway. I was surprised that the colors ran and feathered significantly. The film broke down at the junctions between the colors. There must be some fundamental difference between black and colored Sharpies. Next, Crayola markers. I grabbed a yellow, green and blue from our bin and tested them. I did the yellow first and was ready to declare markers a success. But when I tried the green, the colors ran a bit. Turns out that was one of the Washables. Good to know. Next I tried Mr. Sketch markers. There was a small amount of bleeding where I overlapped the colors, but otherwise there wasn't a lot of feathering or spreading. I'm calling this a success. I tried Prismacolor color pencils next. These worked beautifully! The color glided on, with no tearing or wrinkling. How about stamping with ink? I inked up a foam stamp with Stampin' Up ink and it worked perfectly. My beloved Prismacolor Premier art markers were next. They spread like the Sharpies did, but they didn't cause the film to tear. I tried soft pastels next. They went on beautifully, with gorgeous vibrant color. The same was true of the Holbein Oil Pastels. Finally, I tried washi tape. It behaved perfectly, going on smoothly and peeling up cleanly. So, in summary, chances are good that there is a completely free art material literally being thrown away at a school near you. It is sturdy, translucent (great for tracing), and stands up well to a wide variety of common classroom art materials. Tomorrow I'll show you how I used some Riso film with yet another art supply! Remember our Bear Valley "vacation" back in March that involved a burst water pipe and root beer sno-cone syrup spilled in our luggage? (If not, go here.) What should have been a 5-day snow trip with friends turned into a 33-hour ordeal for just the three of us. We were all pretty miserable for 31 of those 33 hours. But for 2 hours, while we waited for a plumber, we had fun in the snow. We dug out our snow toys, washed the sno-cone syrup off them, and walked the short distance to our favorite sledding hill. We had a snowball fight and had countless runs down the hill. It was wonderful. I debated whether or not to scrap this trip. I tend not to scrap unpleasant things, as I don't usually need help remembering them. Besides, I'd already blogged about this particular fiasco. In the end, I decided to scrap the pictures from our two hours of fun. I had a lot of fun with this layout. The background is a mottled blue from BasicGrey's Lauderdale collection, which is a summer-themed line. 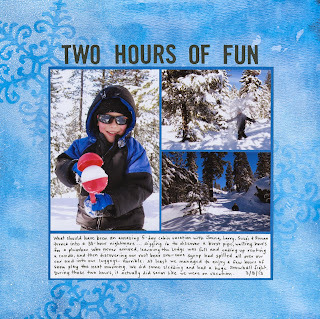 I used white Mister Huey's and the Tattered Angels stencil from June's Flamingo Four to create a wintery background on the summery paper. Then I matted three pictures (one of each of us - that's Steve throwing snow in the top right and me sledding in the bottom right), added my journaling, and included a title. The journaling talks about the negative parts of our trip, but overall the layout makes me smile and captures the two good hours we spent. During Vacation Bible School earlier this summer, Trevor made a beautiful cross-shaped suncatcher by squirting colored glue onto a transparency, letting it dry, then peeling it off. He loves it and shows it to everyone who visits our house. I thought it would be fun to make more suncatchers using a similar technique. Begin by putting a puddle of glue into the middle of the lid. Pick up the lid and rotate it until there is a thin layer of glue covering the entire base. We added more glue to the lids in this picture, as there wasn't quite enough. Better to start with too little though, as you can always add more. Set your lid down on a flat surface and add a few drops of food color. Use a toothpick to gently swirl the colors. Do not overmix! Stop when it reaches this point... or sooner. The colors will continue to blend as the glue dries. I experimented with mine. I tried cutting the suncatcher with scissors to make shapes and it worked beautifully. Would punches work? Yes! Some punches cut cleanly and others did not, but most brands cut through it just fine. As you can see, these stars didn't cut perfectly, but I could easily trim them up. Other than the long drying time, this is a really fun craft to do with kids!